Two Tickets For...: A First Trailer for "Abraham Lincoln, Vampire Hunter" Hits the Web! A First Trailer for "Abraham Lincoln, Vampire Hunter" Hits the Web! 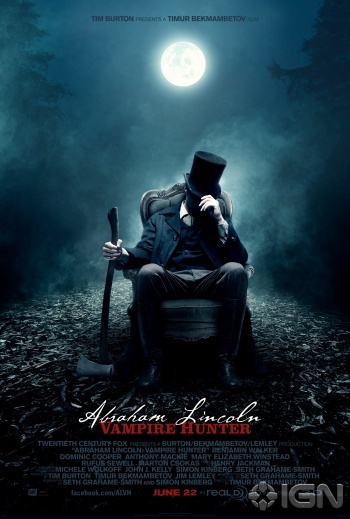 First Official Trailer for "Abraham Lincoln, Vampire Hunter"
Okay! Like I said at the top, I think this looks freaking awesome. What about you? Sarah: Well let’s explain a little bit before we go into what we think about the trailer. This is just one story based off a series of books that takes classic books or famous figures in history and changes them by adding ghouls of some kind and adding a comedic element. "Abraham Lincoln, Vampire Hunter" is based off the book of the same name, written by Seth Grahame-Smith (who also adapted the book for this film), but he first wrote the other well-known book Pride and Prejudice and Zombies, which they are also turning into a movie. Now, this trailer looks awesome and as it gets closer and the theatrical trailer comes out it will shine even more light on the story. A: Even though I haven’t read the book yet (I plan to eventually) I did always think the concept of Abraham Lincoln being a vampire hunter looking to get revenge for the death of some family members was an awesome idea. When I heard they were making into a movie, I got excited, but other than some casting news and a poster (which you can see below) I didn’t know much else about it. This trailer gives me all I need to know. It looks action-packed, it looks atmospheric, and while some may believe the idea of Lincoln being an action hero of sorts to be silly, I think it looks fine in that trailer. Honestly, I didn't even realize it was directed by the guy who directed "Wanted," which is a crazy action film, too, but one that I think is waaaaay too over the top. But going off of first impressions, I'm willing to give him a second chance with this one, especially as it's produced by Tim Burton. S: I like how the stories are kind of tongue-in-cheek. I agree that it looks to be very action packed. I hope that they do a good job on the vampires, as there seems to be several versions of the mythological beings out there on the big screen these days. We will keep you all updated as more information about the movie is released!